Undefeated welterweight prospect Dmitry “The Mechanic” Mikhaylenko (20-0, 9 KOs) will look to make his mark in the wide-open welterweight division against southpaw Ray “The New Ray Robinson” Robinson (20-2, 9 KOs) in the opening 10-round bout of the Kovalev-Pascal II HBO World Championship Boxing event Saturday, Jan. 30 live from the Centre Bell in Montreal, Quebec, Canada. The telecast begins at 9:45 pm ET/PT live on HBO®. Mikhaylenko, 29, from Gelendzhik, Russia, is co-promoted by Main Events and German Titov Promotions. “The Mechanic” is undefeated and stopped his last three opponents, including former interim super lightweight titleholder Johan Perez. This will be his second fight in Canada; he stopped Felipe De la Paz in the fifth round on the undercard of Kovalev-Pascal I.
Robinson, also 29, is a tough southpaw from Philadelphia, Pennsylvania who has not lost a fight in over five years. He has won his last nine fights in a row, five of them by way of knockout. 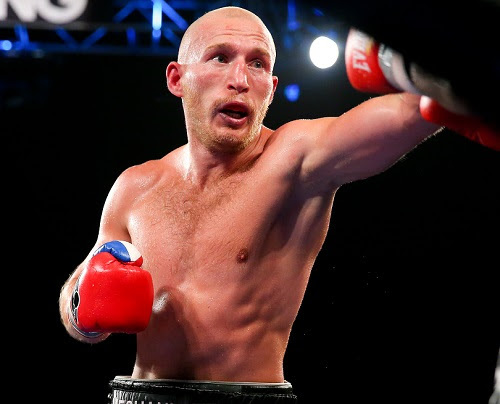 In his last fight he defended his NABO Welterweight Title with a ten-round unanimous decision victory over Sherzodbek Alimjanov back in April of this year. The grudge match for the unified light heavyweight world championship between Sergey Kovalev and Jean Pascal, a Vidéotron presentation in collaboration with Mise-O-Jeu, will be televised live in the United States on HBO beginning 9:45pm ET/PT as well as on pay-per-view TV in Canada. The card is promoted by Main Events and Interbox in association with German Titov Promotions. Tickets are on sale on at www.evenko.ca, at the Bell Centre box office and at Club de boxe Champions in Montreal.